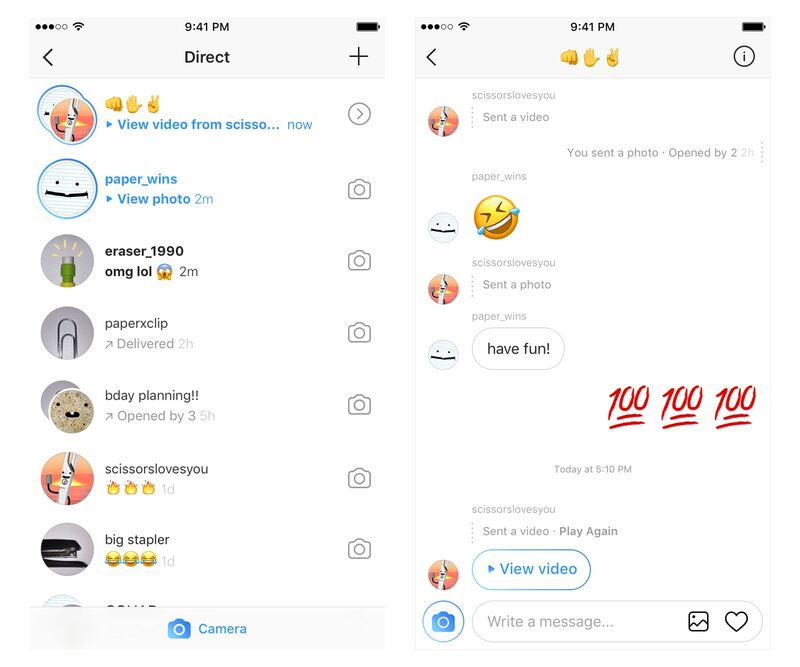 Instagram wants you to have more “fun” with “visual conversations” through its Direct feature, so starting today, Instagram is making the direct-messaging portion of the app much more intuitive and user-friendly. The photo-sharing company is adding disappearing photos and videos to the threads you have with friends, meaning that now you’ll now be able to send one-timers that will show within the chats you already have going, until they are viewed and then gone. This means you can handpick who sees select posts, and you no longer have to share your disappearing videos and photos with all your followers at once. Direct messages can be sent to an individual or a group. To access this new feature, you’ll simply swipe left into Direct, jump into conversations, and tap on the new blue camera icon to send off disappearing photos or videos. When you receive disappearing photos or videos, you’ll see them highlighted in blue within a thread. Senders will see notifications as they are viewed and also should you attempt to screenshot them. Instagram first copied Snapchat’s Stories format, which displays photos and videos taken by someone in chronological order for 24 hours, in August 2016. Since then, Facebook has replicated the same Stories feature in Messenger, WhatsApp, and its main mobile application. Instagram’s private messaging feature, called Direct, now has 375 million monthly users, up from 300 million in November 2016. “We want to make Direct the best place to have fun, visual conversations with your friends,” Instagram said in a blog post on Tuesday.